I bought a used Washing Machine (Miele W828) that looked to be in perfect condition. It actually works perfectly. However, the inside of the Machine smells horrible, like mildew. This smell gets really strong right after a wash. I've read online about doing a Hot Cycle wash to clean the inside of a Washing Machine, and did 2 of those at 95 C / 200 F and it only made the smell stronger. I also read that it could be caused by a clogged drain pump that can be accessed from the front of the machine (by opening a front lid and unscrewing and draining the water), but it had only 2 coins in there. Although the long screw top had some black stuff on it that I tried to clean, the inside of it or the area I pulled it from was not particularly bad. I moved the machine from where it's tucked into the wall to see if any smells were coming from behind it, and I couldn't detect any smells behind the machine. But as soon as I open the front door of the Washing Machine, the smell hits you like a ton of bricks. The smell also hits you when you open the Dispenser Drawer, so I removed the Dispenser Drawer (which is clean) and the inside was very nasty. Based on those pics, the inside of this machine is completely nasty despite the outside of the machine and drum looking perfectly fine and the machine itself working fine. Is this fixable or is this machine doomed? If it's the former, then how can I fix this? First, let me say, you are far from the first person to have smell problems with washers, especially front-loaded ones. This has been the topic of many conversations resulting from home inspections and with concerned customers. I have had followup consults with factory reps, appliance repair specialists and the like. The most common problem seems to be with the rubber sealing rings at the door. Water sits in the folds, mold grows in the folds and is untouched by the "washer cleaners" that are currently on the market. Wonder why they are so popular? some folks have been able to manually clean these areas with bleach and many rags. Others have had to have it replaced then keep it clean before the mold takes hold again. Any closed reservoir can harbor mold and usually does. 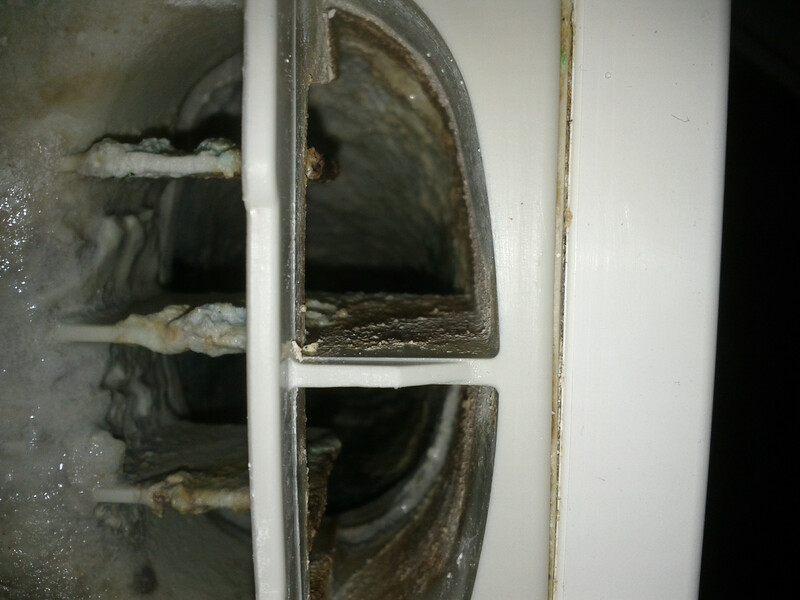 If you cannot access them to clean the mold out, that part usually has to be replaced. The other problem is if small amounts of water sit in the bottom of the unit and don't get expelled. this is easily treated with flushing cycles with bleach or cleaners. Before you completely give up on the unit, see a Bosch dealer with a good service reputation. Several models from several manufacturers have been recalled or service bulletins issued for exactly the problems you are having. The clamp in the back is to bypass the safety switch. 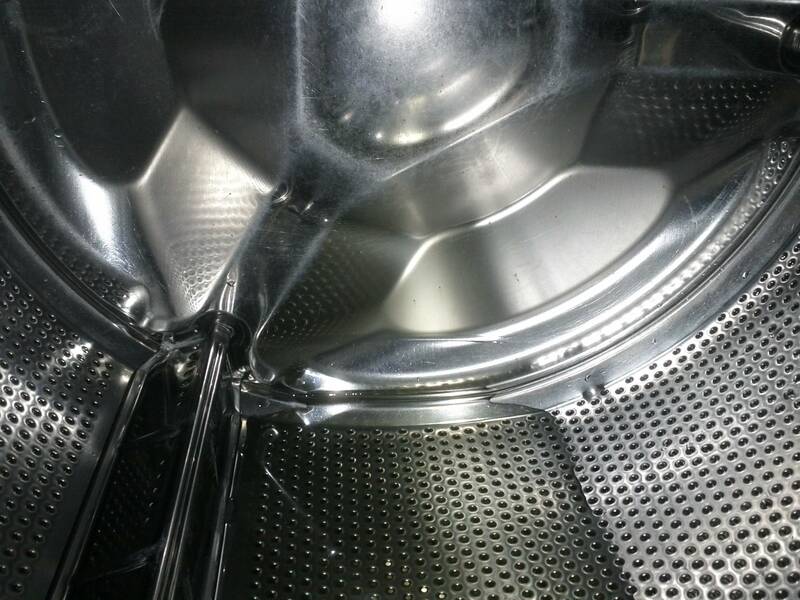 We drain the residual water out of the washer by removing the large object filter, after every load. Yours probably retains a similar amount of water. Then we leave the door open between loads, and sometimes run a fan, even though this is a real pain. Note the wires of a water alarm just visible under the stuffed animal: we've forgotten to replace the filter more than once. Forget about cleaning the inside of the drum mechanically: I watched that process once. The guy knew exactly what to do, and it took most of a day, with part of it requiring a helper. We lucked out as that was a flat rate repair. A bleach load never really helped. A citrus based washer cleaner (not the brand made by Whirlpool) worked better. But ultimately only drying the unit out between loads really was effective. You're not alone. Check out "The Case of the Moldy Washing Machines, Again" from Slate Magazine discussing the recent Supreme Court decision, or the status page of Chimicles & Tikellis on the ongoing lawsuits. Now as to your specific machine @ProgrammerGirl , you're using too much soap. Note the soap scum everywhere in the pictures. Pick up a bottle of citrus cleaner, run a super hot load, and then lay off the suds. Bleach and air. I would run empty bleach cycles (HOT) and let it air out. Repeat a few times. You don't want to have to take it apart to clean anything until you have tried this many times. On front loaders you need to keep the door open to prevent mold issues. Put a cup of dishwasher powder straight into the drum and run it on the hot cycle. Afterwards clean as much mold out of the gasket as you can, including back and underneath the gasket, I have found a rag and a tile grout cleaning brush the most useful as it has stiffer bristles than a toothbrush. Repeat several more times. Observe the chunks of mold and lint floating around during the rinse cycle. Based on internet comments elsewhere, I have tried sodium hydroxide solution (to saponify grease deposits), litres of vinegar, a litre of strong cloudy ammonia, but I have observed the best results with the dishwasher powder and elbow grease. Oxalic acid solution (timber bleach, also in Bar Keepers Friend) could be an interesting future project, as could sulfamic acid. I also do the same as Bryce and remove the drawer, manually drain the residual water by removing the large filter and run a fan blowing into the drum after every use. You need to lower the relative humidity inside the machine to a level unfavourable for mold growth. Removing a stagnant puddle (draining residual water) and aiding evaporation (running a fan) are simple ways to do this. Avoid liquid washing detergents and fabric softeners (search the internets for why these should be avoided). Change to washing powder, use less than the manufacturers suggestion and use vinegar in place of the fabric softener. Washing powders are basic, so it makes sense to run a weak acid like vinegar in the rinse to neutralise any remaining detergent. Wash with warm water rather than cold, the increased temperature makes everything work better. 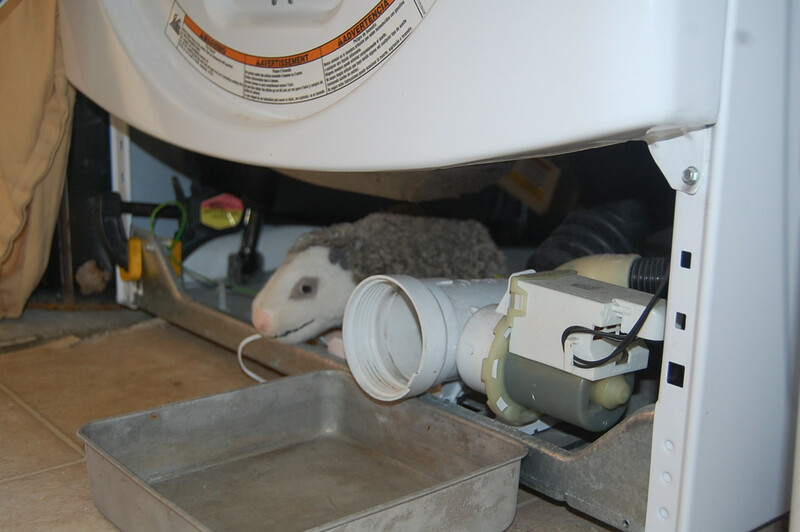 Next to the other answers, I'd also make sure that your drain pipe has a proper siphon that blocks air from the drain going back into your machine. I had a problem with a machine that had build-up of Downy. I'm guessing that originally the formula was much more watered down and later the concentrated formulas came out. When poured into the dispenser, due to the viscosity, it wouldn't entirely come out. The stuff actually ended up caking, turned black and moldy, and reeked. I disassembled the dispensers, used a bottle brush and lots of warm water and time and managed to clean them. I now dilute the concentrate with water in a small tupperware and shake to mix before putting it in to prevent it from happening again. I also ran several of the washer machine cleaners to try and remove the stuff behind the tub - the first time I did it, the water turned blue from all the excess dried behind the drum. Never use vinegar to clean washing machine because it has an acid effect and will eat away all the hoses and plastic components in the washer over time. Bleach is fine. Fill a bucket with hot water and a cup of bleach, and use a brush to scrub between the inner drum and outer tub thoroughly. Go all the way round a few times depending on how dirty the drum is. After each rotation pour a kettle of boiling water over the drum so that water runs down the outside of inner drum -- this will help dissolve any gunk and dirt that has been loosened by scrubbing. Take off the agitator or wash plate and scrub that clean as well. Wipe down any dirt and mildew off inside of washer wherever it is dirty with a cloth with hot water with bleach. Once you have scrubbed the inside of drum and washer clean, put the machine back together. Fill the machine on highest loaded level with hot water setting. Add 1-2 cups of bleach (never use vinegar) and when machine stops filling, let it agitate for a minute to mix bleach through the water, then open lid of machine or pause the machine and let the water and bleach soak in the washer for at least an hour to dissolve all the dirt and grime and mildew. After one hour close lid to restart machine or hit start button to restart cycle allowing machine to go through the full largest cycle without any clothes in the washer and this will clean out washing machine very well. If you see any residue from the dirt and grime in drum when cycle is finished wipe it out or run another cycle without clothes if need be. If you can smell the bleach after all this fill the machine with cold water on smallest water setting add a 1/4 cap of fabric softener and run the small load cycle and once finished machine will smell fine inside. This is how I clean everyone's machine that I service. It is best to do this at least twice a year. Good maintenance will prevent grime build up and bacteria in your washer and it increases life expectancy of the machine. Not the answer you're looking for? Browse other questions tagged mold washing-machine smell or ask your own question. Why might our washing machine cause our clothes to smell damp when dry? 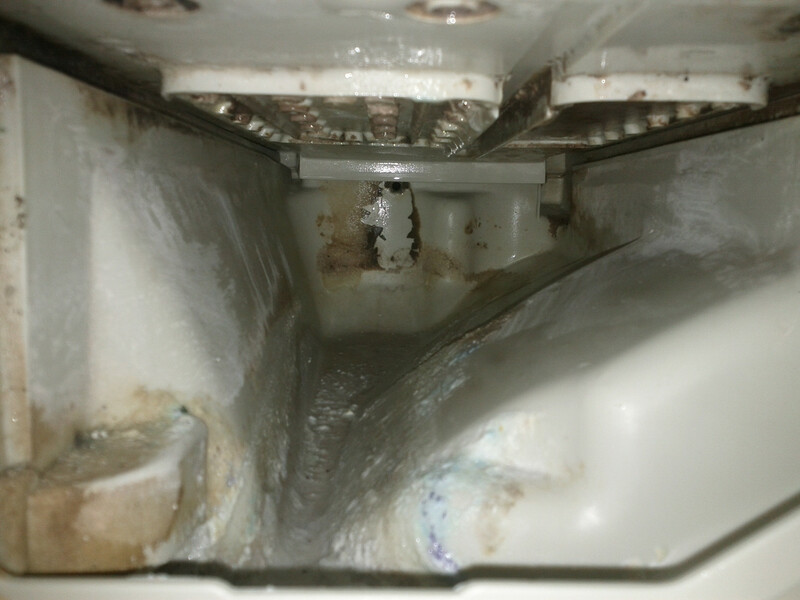 How can I locate the source of a washing machine leak? When to turn on the water for my washing machine?